Coming days after yet another mass shooting in the US—this time at a high school in Santa Fe, Texas, where ten people were killed—an exhibition featuring art formed from dismantled firearms opened in Oakland, California on Tuesday (22 May). The Alameda County District Attorney’s Office, together with the Robby Poblete Foundation, organised the show and commissioned local artists to transform hundreds of guns the DA’s office has confiscated over the years. After her 23-year-old son Robby was shot and killed in Vallejo in 2014—with a firearm that was stolen from a home and sold illegally on the street—Navalta launched the foundation and a gun buy-back programme last year, having learned that most violent crime is committed with stolen weapons. “I wanted to come up with a way to get those unwanted firearms out of circulation and prevent them from falling into the wrong hands,” she explains. “Then I started to think about what happens to the guns after they’re collected.” At the time of his death, Robby Poblete was training to weld and was eagerly planning art projects with scrap metal; the art commissions honour his unrealised projects. The pop-up Oakland exhibition, up for a month at 9th and Washington Streets, emerged after the DA’s office, seeking a more environmentally friendly means of emptying its evidence lockers, learned of the foundation and sought to duplicate its project. 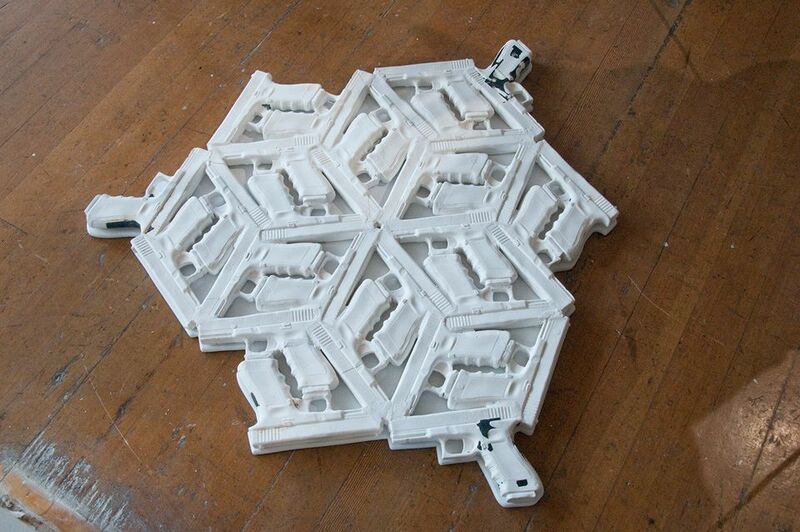 It includes work from six artists, such as Kevin Byall, who has created a stand-alone double-helix sculpture. 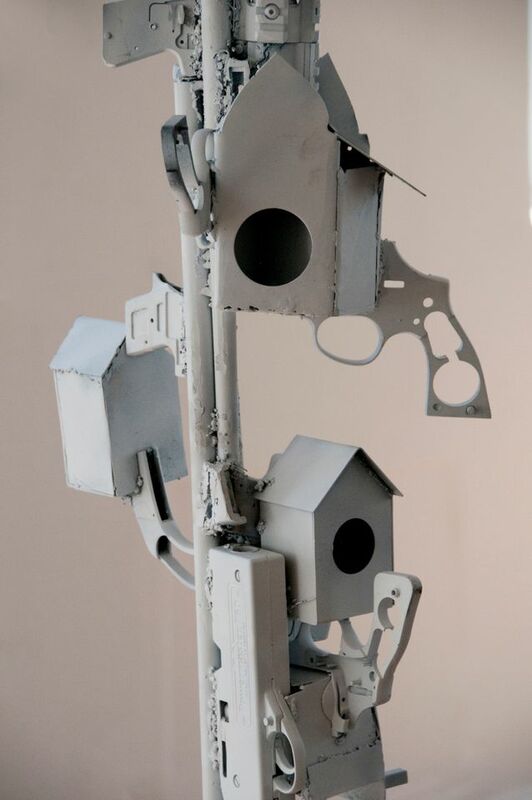 “Made out of six different repurposed gun parts, it is designed to convey how engrained we are to violence and the difficult reprogramming we face to change that construct,” the artist explains in a statement about the work.